Thought to be the oldest wind instrument the Didgeridoo is said to originate from the indigenous Northern Australian Aboriginal peoples. Usually cylindrical or conical, they are often 1 to 2 meters in length, the longer instrument usually offering a lower ‘pitch’ or ‘key’. Beeswax mouthpieces warm to form a better seal for the player, who, after much practice, can produce continuous notes using a ‘circular breathing’ technique. 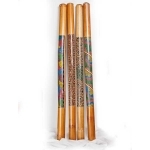 In Zensation we sell a range made from Bamboo (shown here), Teak and Eucalyptus woods all of which are produced by hand.